Was Eugenio Figueiredo helped by Judge Damiani? A new article on Business Insider claims that Sepp Blatter’s corruption scandal is not done yet. 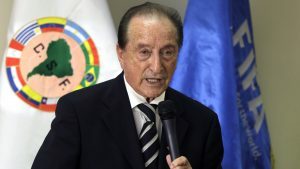 After the case of Sepp Blatter, which revealed a vast amount of corrupted activities officials of FIFA were committing, another possible fraud was detected – the aiding of judge Damiani to Eugenio Figueredo, a former Uruguayan footballer and American football executive in his case with the violation of the law. The article named FIFA judge faces investigation over offshore accounts, which was written by Graham Dunbar, presents the reader with information regarding the case of Eugenio Figueredo. Given that the above named football executive is related to corrupted actions that were committed by members of FIFA, his relationship with Uruguayan compatriot, Judge, Juan Pedro Damiani, was put into discussion. Given that the two Uruguayans were believed to have business relationships. From this can be inferred, thus, that in order to not harm their relationships, or due to the fact that they had business relationships, then Damiani aided Figueredo in his case. Their relation was revealed through documents that were called “The Panama Papers,” where a vast amount of data was gathered from Damiani’s firm Mossack Fonseca. However, the question is still open and under investigation, as no evidence was provided. Thus, in order to determine weather Damiani was involved in the violation of the FIFA Code of Ethics further investigation was assigned. The information provided in the article resutls quite controversial due to the fact that Damiani was one of the original members of the committee since its set up in 2006. Despite the fact that the information provided could be quite threatening for the future of Damiani and Figueredo himself, the first has already resigned from his position following the prosecution of tax evasion that was put on him, as explained above. Hence, his decision to resign can be perceived as a move to alleviate the situation in which he is, intending to avoid responsibility for his (possible) acts. Why is Relevant to the Class? The investigations that occurred in FIFA are relevant to the class due to the fact that it demonstrates that despite people having important titles and job positions, being part of the most influential persons on a certain branch (sports, soccer), the law still prosecutes those who have violated it (Chapter 5). The evidence that one can provide so as to reveal certain corrupt acts is key in order to prove their guilt. The article permits us to understand that even though it is obvious that Damiani and Figueredo were connected with the frauds of tax evasion, none of them have been declared guilty, and investigation is still taking place. Thus, in order to prove that a person is guilt and deprive them from their freedom or right to effecutate their labor, it is necessary to provide eloquent evidence. Also, this cases that occurred in FIFA, as mentioned in the article, have occurred several months ago, and are still open to investigation, proving that the law, despite working slow in some (or the majority of) situations, it still results effective if suspicions that have logical connections are detected. I consider to be correct to proceed with further investigation so as to clearly identify the persons behind the corrupt acts that have been detected connected to the FIFA. Also, FIFA itself, as an organization, is obliged to determine and control its culture and ethical climate. This climate shapes the actions and attitudes of the people that work there, such as Figueredo and Damiani, who due to the fact that the climate in the organization is not properly shaped, opted for having less desirable ethical performances. Dunbar, G. (2016). FIFA Judge Faces Ethics Investigation Over Offshore Accounts. Business Insider. Retrieved from: http://www.businessinsider.com/ap-fifa-judge-faces-ethics-investigation-over-offshore-accounts-2016-4. Pielke, Roger. “How can FIFA be held accountable?.” Sport management review16.3 (2013): 255-267. Yuan, Guoying, et al. “Strategies to Avoid Corruptions in FIFA.” International Journal of Business and Management 6.6 (2011): 215. Verver, John. “Lessons from the FIFA corruption scandal.” Risk Management 62.7 (2015): 16.